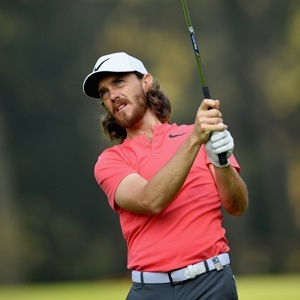 Hong Kong - Tommy Fleetwood finished the opening round of his European Tour defence on Thursday with a pin-point birdie to keep the pressure on early pacesetters in testing conditions at the Hong Kong Open. The Englishman, playing in a group with compatriot Matthew Fitzpatrick and defending tournament champion Sam Brazel, hit an iron shot from 106 yards out to within inches of the hole to card a two-under-par round on the first day of the season-opening event. "It was a tough day - it was Baltic this morning. Once you get off the fairway it's so difficult," said Fleetwood. "I'm glad I birdied the last hole really, which made me feel a bit better. I played really nice, I felt comfy out there and hit a lot of nice putts." Fitzpatrick fared even better on a windy morning, hitting six birdies to finish with a 66 on the par-70 course, one behind lunchtime clubhouse leader SSP Chawrasia of India. "We had the crowd following Tommy just seeing as how he won the Race to Dubai the other day," said Fitzpatrick. "It's always good to play with Tommy, I played with him when I just started as a pro." "No offence to him but I've played with him a few times before now, so you get used to it," he joked. Fitzpatrick fought back from some tricky positions, recovering from next to a path off the par-five 3rd hole with a fine pitch shot leaving him a simple tap-in for birdie. Fleetwood sealed victory in the 2017 Race to Dubai on Sunday, pipping Justin Rose to the European Tour crown. Rose and Masters champion Sergio Garcia are among the afternoon field in a competitive line-up at the Hong Kong Golf Club. Selectors opt for Amla in Proteas' 2019 World Cup squad Sanity prevails! Amla backed for 2019 CWC As it happened: Proteas 2019 CWC squad announcement Late Lions shock as coach Swys de Bruin heads home CWC Proteas: THIS will be their sore thumb!